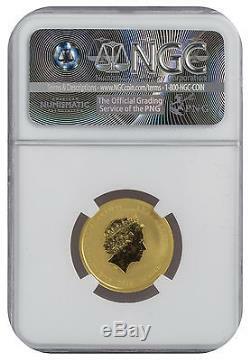 This beautiful 1/4 oz Gold Perth Monkey has been graded a perfect MS70 by NGC. The Australian Lunar coin series epitomizes The Perth Mint's rich tradition of minting bullion coins portraying Chinese themes. The reverse design on this year's releases celebrates the 2016 Year of the Monkey, one of 12 animals associated with the ancient Chinese lunar calendar. In Chinese culture, people born in the Year of the Monkey are regarded as intelligent, quick-witted, optimistic, ambitious, and adventurous. 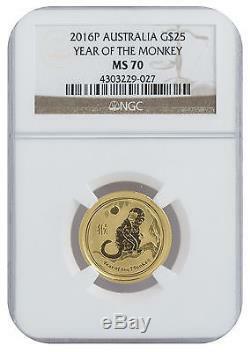 The item "2016 1/4oz Gold Perth Lunar Year of the Monkey MS70 NGC (#027)" is in sale since Sunday, February 05, 2017. This item is in the category "Coins & Paper Money\Coins\ World\Australia & Oceania\Australia\Gold".